One of the more interesting aspects of photographing with a group of other photographer friends is that you get to observe their passion for subjects which leave you cold. 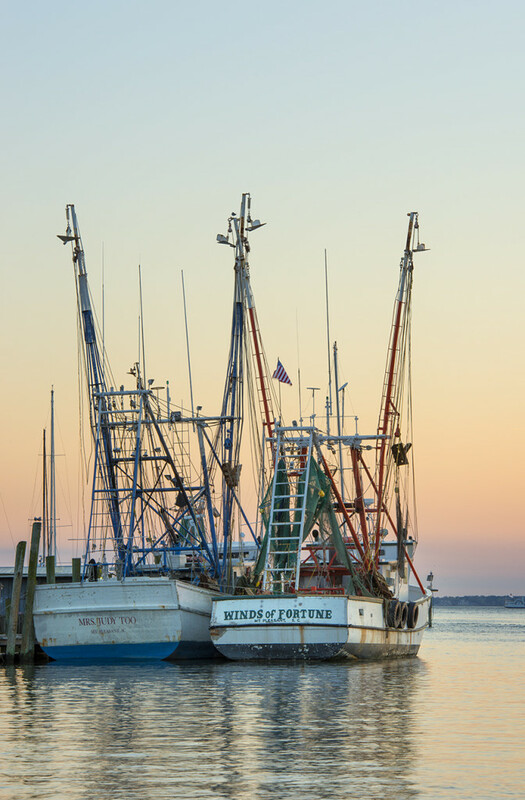 While shooting with my friends Charles, Mike and Ted in South Carolina, I had just such an experience when they suggested we go and photograph the fishing boats at Shem Creek. They were very excited at this thought, while I was seriously contemplating breaking ranks and heading off to do my own thing. But, for once, I set aside my selfish streak and tagged along. It was long afternoon, five hours or more dragging into evening, waiting for the light to change or for some clouds to appear in the bald sky. The light got a little better as evening approached and a pinkish tint appeared on the horizon. But the sky did not improve, no matter how patiently our group waiting. Well, the rest of the group waited patiently. I waited impatiently. This was not my type of photography. But my friends’ enthusiasm, even excitement, at shooting the fishing boats was palpable. They got very excited when I spotted a tanker passing out at sea and managed to capture a composition of two fishing boats AND an oil tanker (second image). As the sun set, the pinkish light turned to gold and we all turned to face the land. One of my friends had noticed how the low angle of the setting sun was reflecting in one of the windows of the boat house, creating a glinting, golden highlight. More hubbub, as my excited friends rattled off multiple frames of the boathouse. I didn’t get that shot…. One welcome diversion I found during our long sojourn on Shem Creek was that a group of pelicans was ferrying between the land and the sea, swooping low over the creek and flying its entire length at a height of just a foot or so above the water. I consoled myself by using the time to practise my almost non-existent skills at photographing moving subjects, something which I normally go out of my way to avoid doing. 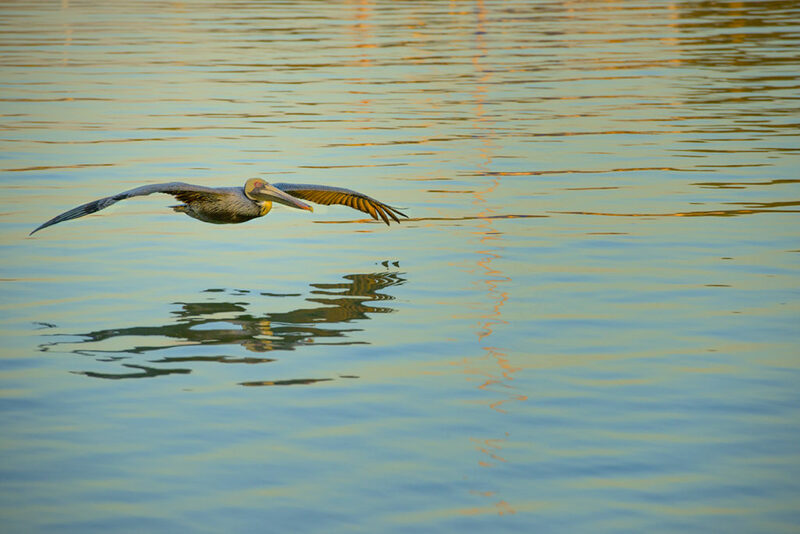 Out of about twenty frames that I shot, I got maybe two or three where the fast-flying pelican was sharp. This is the best of them. 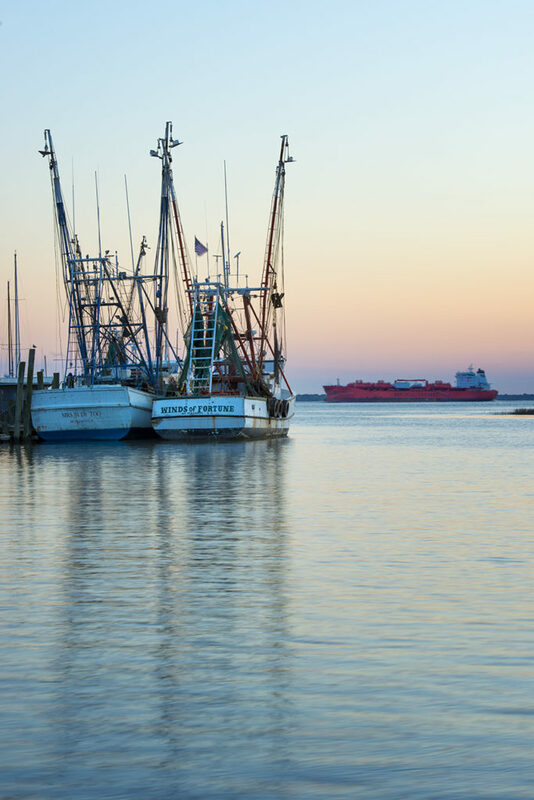 So, what I learned from my visit to Shem Creek was the benefit to participating in my friends’ passion, even though I don’t share it. I also discovered that fishing boats don’t get my photographic juices flowing (I suspected as much) and that, no matter how bored you are at a given location, you can usually find something worth shooting, wherever you are. 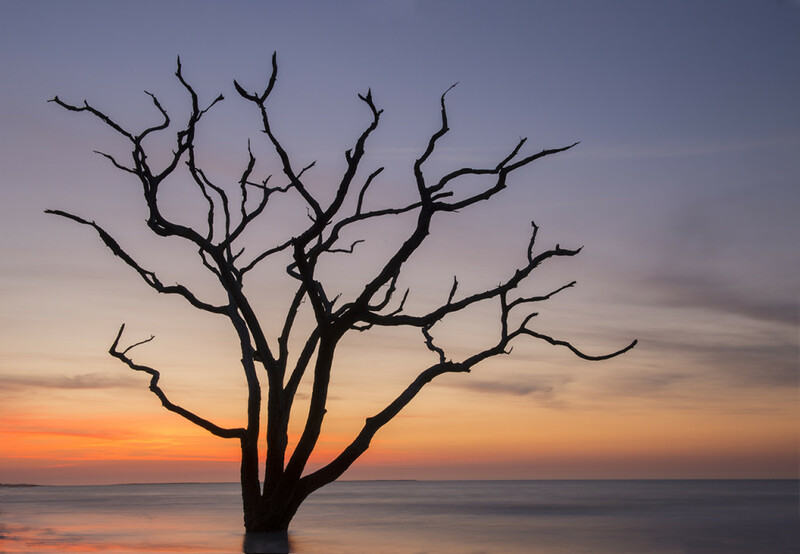 Finding words to render an accurate description of the tree bone yard at Edisto Island in South Carolina may be a challenge beyond the bounds of my literary. Walking on to the beach for the first time in the pre-dawn darkness felt like stepping off Earth and setting foot on to another planet. My senses were disoriented, my brain struggling to make sense of what my eyes were seeing. Trees that should have been alive were dead. Sands that should have been dead came alive in the roiling surf. 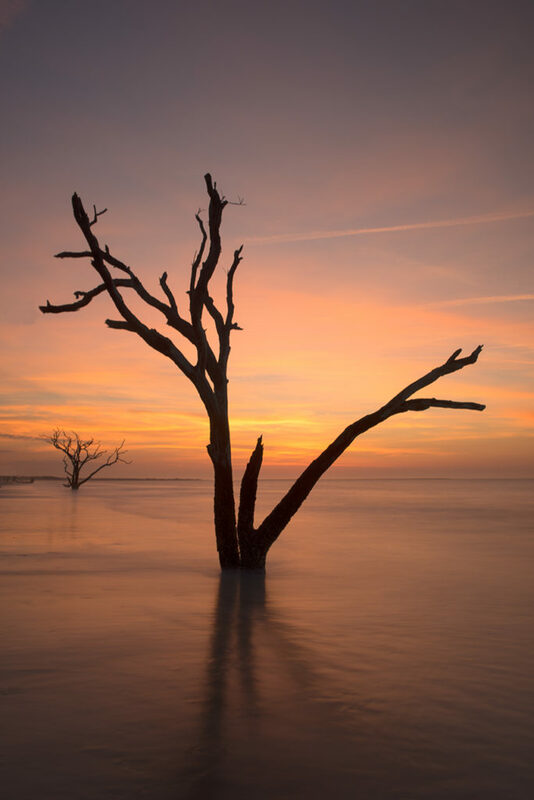 A vast expanse of beach littered with the splintered remnants of hundreds of dead trees, some jammed, half-sunk, into the sand, others pitching and rolling in the repeating waves. Bald expanses of pale grey, pockmarked wood, stripped of vegetation. 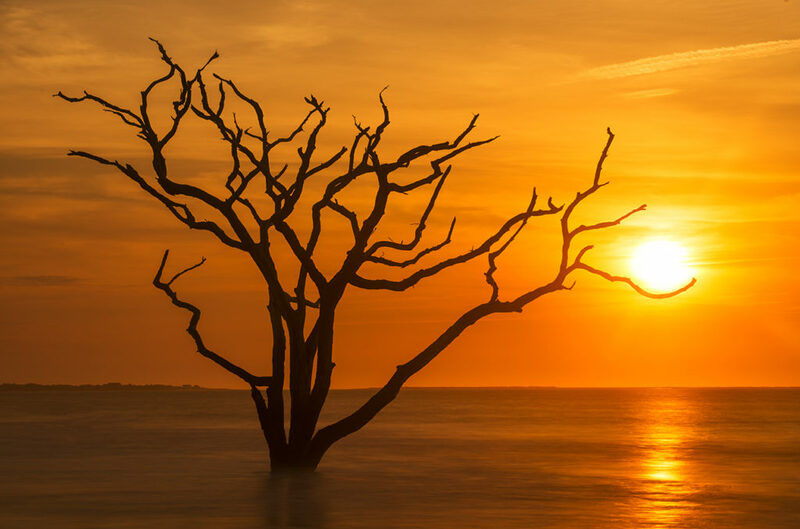 As the darkness receded, my eyes began to make out the emerging shapes of trees protruding from the sea, a few hundred feet beyond the shoreline. This made no sense: since when do trees grow in the sea? 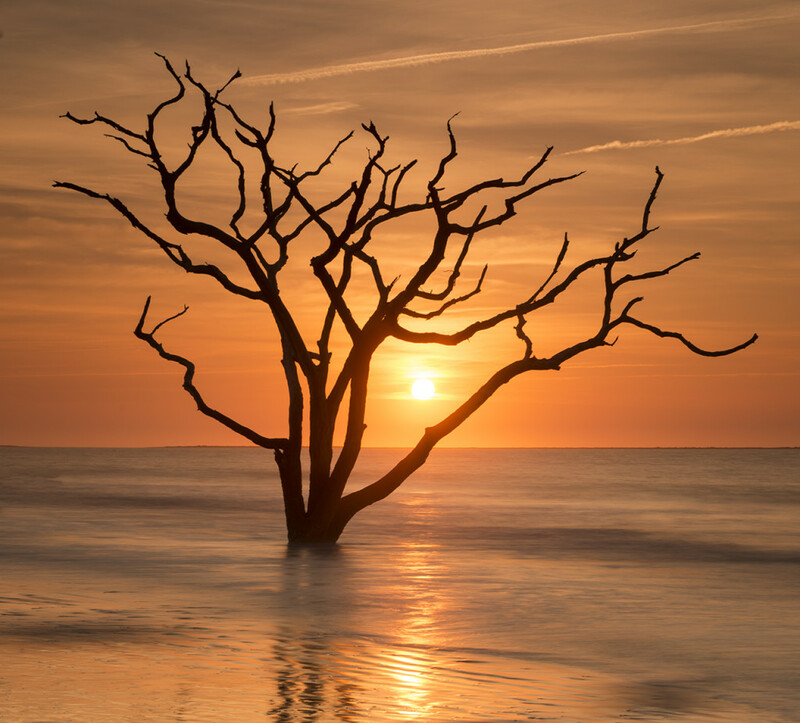 Except, on Edisto Island, they do. After several minutes of just standing still, trying to take in the scene, a tiny hole opened in the sky to the north, just above the horizon line, and purple light spilled out, throwing the trees into silhouette and casting their shadows on to the water. The purple light turned to pink, then to orange as the sun broke the horizon and climbed the sky. Far, far too fast. 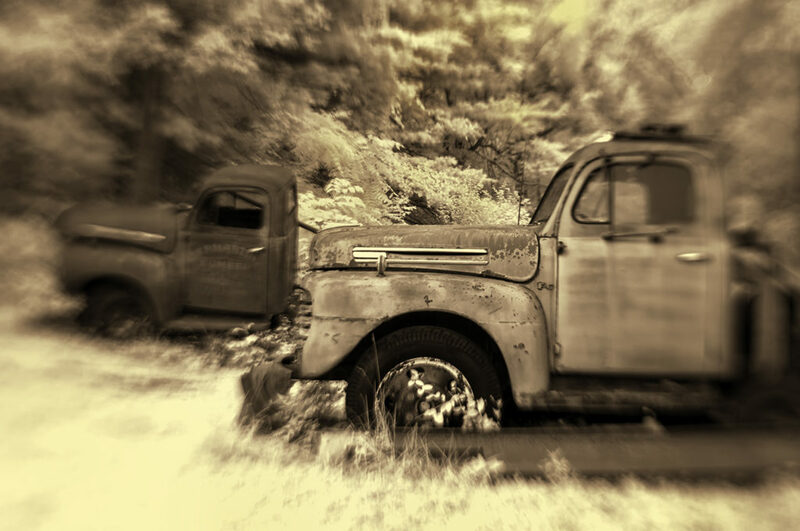 I recently returned to one of my most-visited shooting locations – a secret treasure-trove of old Ford trucks in rural Maryland. 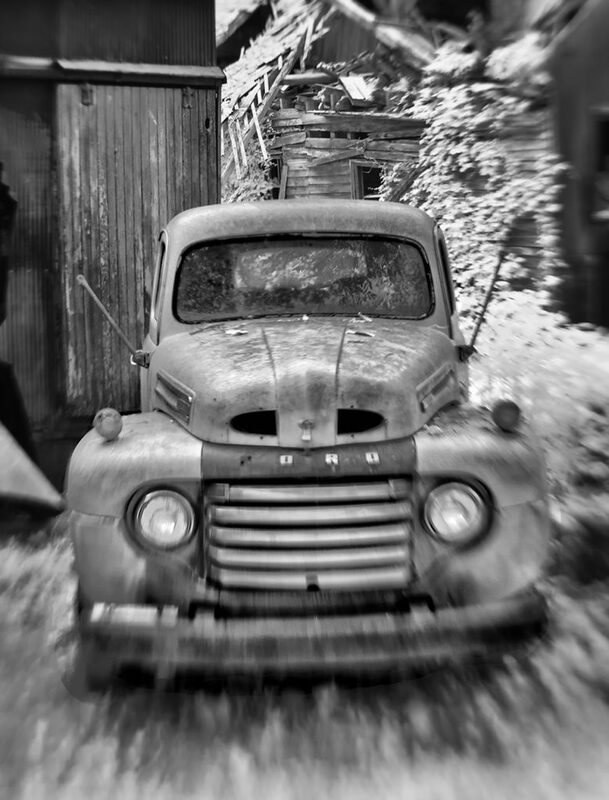 I have photographed these trucks more times than I can count but, this time, I challenged myself to create different compositions by going there with just one camera body and one lens: a Nikon D90 converted to 650nm infrared and a LensBaby Composer Pro with Sweet 35 Optic. It was a difficult challenge and my wastage rate (the number of images I delete immediately in-camera) was much higher than it usually is. But I consoled myself with the knowledge that this was a positive, a sign I was out of my comfort zone and that, therefore, I was learning something new. For each image, I tried to pick a particular area in the image to place the very limited in-focus spot of the LensBaby (the “E. P. Martin, Lumber” inscription on the door of the first truck; the “_ORD” name plate on the second, including the missing “F”). 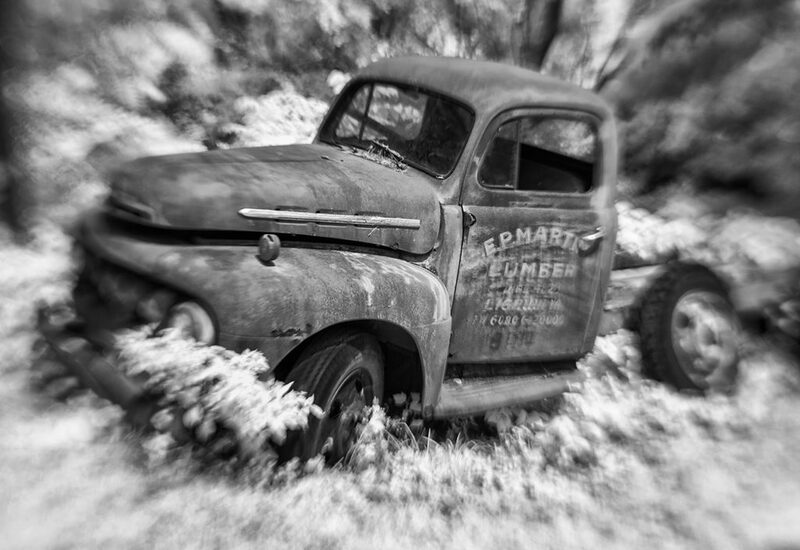 I found this worked quite well when the subject of the image was just one truck and there was clear lettering to focus on. It worked less well, though, when there were two trucks in the composition, as in the third image.